This recipe was created in honor of President Andrew Jackson because of his enjoyment of bourbon. 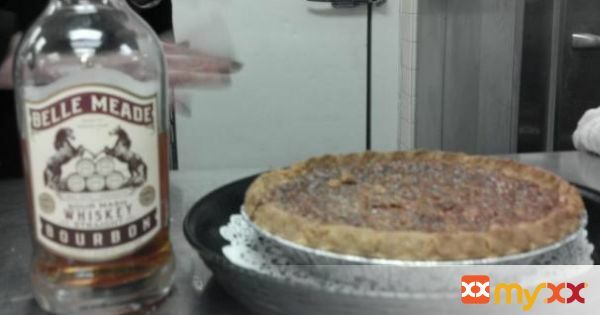 My pies are made with the wonderful Belle Meade Bourbon, which was produced back when President Jackson was alive at one of Tennessee's historical plantations.Today, this tasty bourbon is made by the Nelson brothers of Nelson's Greenbrier Distillery, which is available at www.greenbrierdistillery.com. This is the bourbon I recommend, but you may substitute with the bourbon of your choice. 2. In a large bowl mix the sugar and butter until soft. 3. Add the eggs, corn syrup, salt, bourbon, and vanilla. 5. Spread the pecans and the chocolate chips in the bottom of the pie shell. 6. Pour the filling into the shell. 7. Bake for 40 to 50 minutes.